"Regions of India" redirects here. For ecological regions, see Ecoregions of India. For Climatic Regions, see Climatic regions of India. The administrative divisions of India are subnational administrative units of India; they compose a nested hierarchy of country subdivisions. Indian states and territories frequently use different local titles for the same level of subdivision (e.g., the mandals of Andhra Pradesh and Telangana correspond to tehsils of Uttar Pradesh and other Hindi-speaking states but to talukas of Gujarat, Goa, Karnataka, Kerala, Maharashtra, and Tamil Nadu). The smaller subdivisions (villages and blocks) exist only in rural areas. In urban areas, urban local bodies exist instead of these rural subdivisions. North Eastern Council, comprising Assam, Arunachal Pradesh, Manipur, Meghalaya, Mizoram, Nagaland and Tripura; The State of Sikkim has also been included in the North Eastern Council vide North Eastern Council (Amendment) Act, 2002 notified on 23 December 2002. Southern Zonal Council, comprising Andhra Pradesh, Karnataka, Kerala, Puducherry, Tamil Nadu, and Telangana. India is composed of 29 states and 7 union territories (including a national capital territory). The union territories are governed by administrators, appointed by the President of India. Two of the territories (Delhi and Puducherry) have been given partial statehood, with elected legislatures and executive councils of ministers, but limited powers. 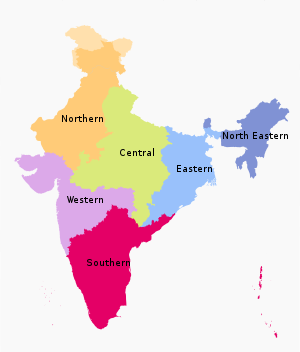 This is a list of unofficial, or quasi-official, regions of India. Some are geographic regions, others ethnic, linguistic, dialect, or cultural regions, and some correspond to historic countries, states or provinces. Some states consist of regions, which have no official administrative governmental status. They are purely geographic regions; some correspond to historic countries, states or provinces. A region may comprise one or more divisions, averaging about three divisions per region. However, the boundaries of the regions and the boundaries of the divisions do not always coincide exactly. So far there has been no movement to give the regions official administrative status. If this was to be done, it would presumably require that the boundaries of the regions be slightly modified so that they correspond exactly with their constituent districts. Many of the Indian states are subdivided into divisions which have official administrative governmental status and each division is headed by senior IAS officer called Divisional Commissioner. Currently, administrative and revenue divisions exists in all states except Gujarat, Kerala, Tamil Nadu, Andhra Pradesh, Telangana, Sikkim, Manipur, Tripura, Mizoram and all union territories apart from Delhi. States and territories (or divisions) are further subdivided into districts (zilla), of which there are 722 (as of 2018). Each District is headed by an IAS officer called District Magistrate. Tehsils, talukas, sub-divisions, mandals, circles, headed by a Tehsildar or Talukdar or MRO, comprise several villages or village clusters. The governmental/ elected bodies at the Tehsil level are called the panchayat samiti. The block or Community development block or CD Block is often the next level of administrative division after the tehsil. Villages are often the lowest level of subdivisions in India. The governmental bodies at the village level are called Gram Panchayat, of which there were an estimated 256,000 in 2002. Each Gram Panchayat covers a large village or a cluster of smaller villages with a combined population exceeding 500 Gram Sabha. Clusters of villages are also sometimes called Hobli or Patti. Certain governmental functions and activities - including clean water availability, rural development, and education - are tracked at a sub-village level. These hamlets are termed "habitations". India is composed of 1,714,556 habitations  In some states, most villages have a single habitation; in others (notably Kerala and Tripura) there is a high ratio of habitations to villages. A metro area usually comprises multiple jurisdictions and municipalities: neighbourhoods, townships, cities, exurbs, suburbs, counties, districts, states, and even nations like the eurodistricts. As social, economic and political institutions have changed, metropolitan areas have become key economic and political regions. Metropolitan areas include one or more urban areas, as well as satellite cities, towns and intervening rural areas that are socio-economically tied to the urban core, typically measured by commuting patterns The metropolitan cities of India are: Mumbai, New Delhi, Kolkata, Chennai, Bengaluru, Hyderabad, Pune and Ahmedabad. ^ "Archived copy - Table 1.1 - India at a Glance - Administrative Division - 2001" (PDF). Office of the Registrar General of India, New Delhi. Archived from the original (PDF) on 24 September 2015. Retrieved 18 August 2018. ^ "Zonal Council". mha.nic.in. Archived from the original on 12 May 2017. Retrieved 26 October 2016. ^ "THE STATES REORGANISATION ACT, 1956 (ACT NO.37 OF 1956) PART – III ZONES AND ZONAL COUNCILS" (PDF). Interstatecouncil.nic.in. Retrieved 27 December 2017. ^ "PRESENT COMPOSITION OF THE SOUTHERN ZONAL COUNCIL" (PDF). Interstatecouncil.nic.in. Retrieved 27 December 2017. ^ "Vijayawada is Andhra Pradesh's new capital". Deccanchronicle.com. Retrieved 27 December 2017. ^ "Appointed Day for Telangana State". Newindianexpress.com. Retrieved 27 December 2017. ^ "Statement showing the Nomenclature and Number of Sub-Districts in States/UTs". Office of The Registrar General & Census Commissioner, India, New Delhi. 2010–2011. Retrieved 3 October 2011. ^ "List of Mandals" (PDF). msmehyd.ap.nic.in. Andhra Pradesh State. Archived from the original (PDF) on 11 September 2016. Retrieved 3 September 2016. ^ "Names of Blocks of Jharkhand". Jharkhandi Baba. 21 October 2017. Retrieved 21 October 2017.